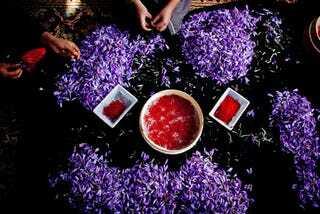 The trade in saffron is estimated to be of an annual value in excess of 200 million USD to Afghanistan. Agricultural produce programs including Saffron are being offered to farmers as an alternative to the harvesting of poppies, used in the production of heroin and in breaking reliance upon financial support provided by drug organizations linked with counterinsurgency elements such as the Taliban. In western Herat province, which borders Iran, the challenge is seen to be to be able to convince farmers of the long term benefits of replacing the growing of poppies with the purple crocus plants whose highly prized stigmas produce the spice used for seasoning and colouring agent in cooking. Image via Getty.